Here is a quick post to bring you some winter comfort. 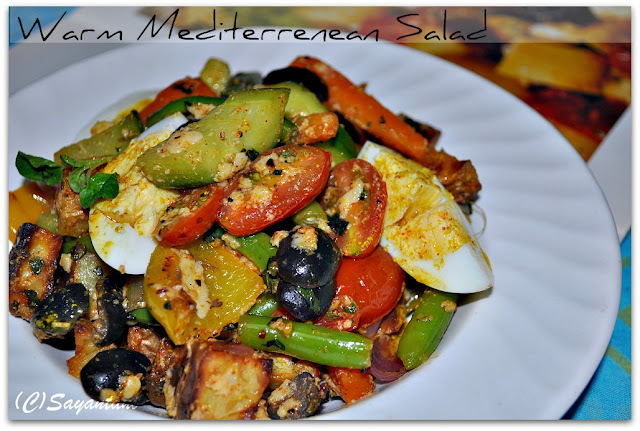 A perfect bowl of warm vegetable and egg salad. We love this salad and it fits the bill perfectly when you don’t want to slog in the kitchen for hours to prepare dinner. Just cut the veggies thickly, blanch them in salted water, toss with some olive oil and herbs and there you are, with an warming meal. Serve in pretty bowls, curl up on the sofa, wrap your finger tightly around it and enjoy the goodness. 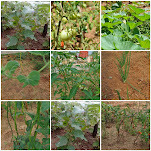 I prepared this long back in Bangalore, when the single cherry tomato plant from my green patch was generous enough to fulfill all my requirements. It was difficult even for us that the tree grew from a single cherry tomato that I brought from my favourite super market and just buried the whole thing in the vegetable garden. Almost a year later that turned into a huge bush laden with small cutesy tomatoes. I really miss that garden especially when am tied here with two tiny spaces passed on as balconies. 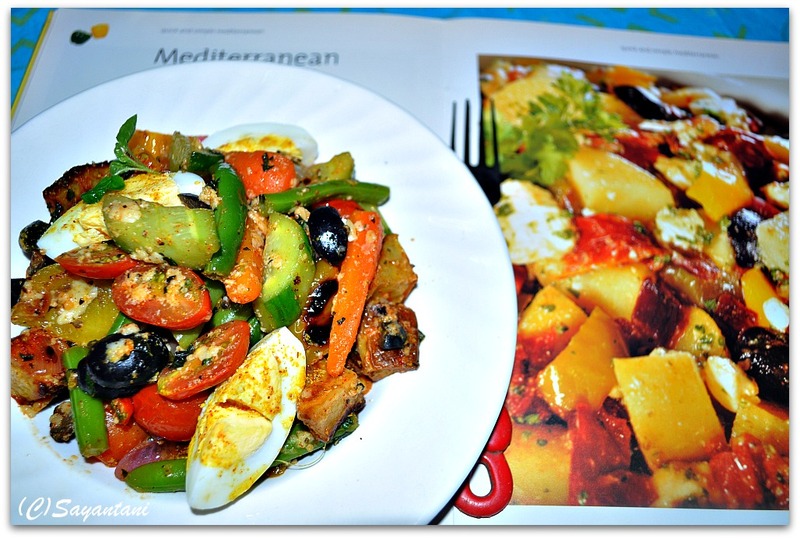 The recipe belongs to a cookbook called ‘Mediterranean; quick and simple recipes’, which I got from my library. it’s a paperback but contains some real good recipes. After drooling at the picture for some days I finally decided to make it with some minor amendments to suit my situation. So here is my version. Pardon the lousy pictures which were clicked at night and we then were really struggling with the new DSLR. Give it a try this season. It’s a bowlful of goodness, which will keep you warm. In a small bowl take the eggs with little salt and water and boil for 7-8 minutes. Drain, peel and cut in quarters. Keep aside. Peel and cut the cucumbers in thick chunky pieces. Slice carrot in thick 1” longg batons. Remove the sides of the beans and cut in half. Cut capsicum and onion in big chunky squares. Remove the skin of the mushrooms and cut in half. Chop the garlic and fresh basil very finely. Blanch the beans and carrots in salted water or micro for 5-6 minutes. In a small bowl take 1 tbsp olive oil, mustard, salt and lemon juice. Mix well and keep aside. Once the veggies are blanched drain the water and keep aside. In a big pan heat 1 tbsp olive oil. Add the chopped garlic and fry till you get the garlicky smell. Add cubed onion and just stir for a few seconds. Add the capsicum and mushroom. Sauté on high for a minute to soften the mushrooms. Add the paneer pieces, blanched veggies, tomato and chopped basil. Mix. Switch off the heat and add the quartered eggs, chopped cucumbers, olives and the dressing. With a big spoon mix very lightly to coat everything well. If you like add more olive oil. Finally sprinkle the grated cheese and serve warm. 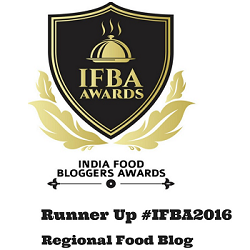 Am planning to make it soon if I get to find some feta cheese in Kolkata. Thanks to Miri. She has given me some information which am going to look out for this Saturday. I once added some roasted potato too. It tasted divine. Give me that plate,seriously feel like finishing it rite now..Prefect salad to keep us warm while its too cold outside.. This salad sounds yum and I love the idea of roast potatoes with it !! You got a new DSLR ? Wow !! Which one is it ? 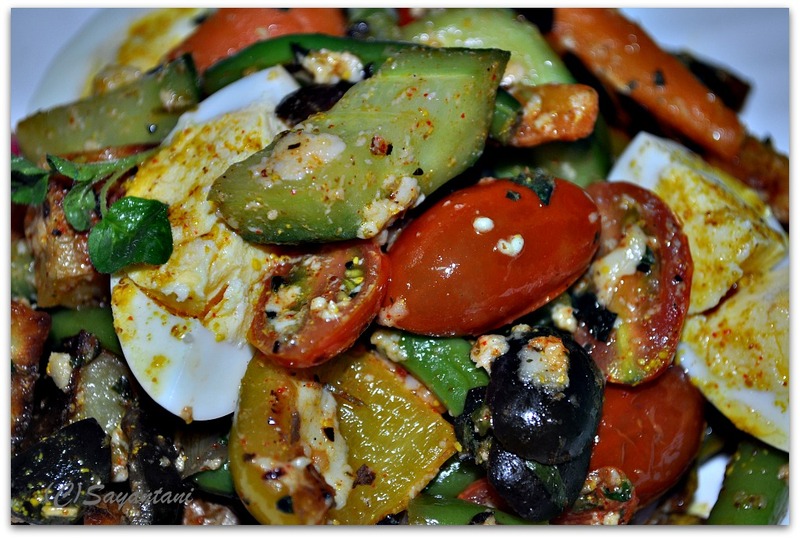 The salad looks more than a salad can ask for.The clicks are classic too Sayantani.Cheers ! Thanks buddies for liking this. Would love this salad any day.I am getting nice tender Israeli cucumbers here and this salad would turn out really good with that. Have planted 20 cherry tomato plants this season, let's see how much i get as last years the squirrels enjoyed the most of it :-) And i didn't have the heart to shoo them away. your picture looks so appetizing. I would never have thought to add eggs to rhe salad- roasted potatoes sound great too! It's ridiculous that the feta is available only on 1 kg quantities, must be only targeting commercial users. If someone is travelling from Delhi to Cal, let me know and I will be glad to send you some good feta. 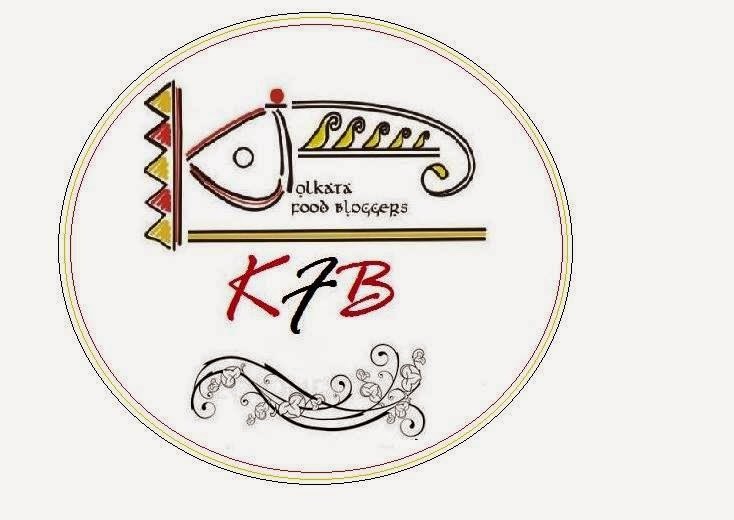 It looks wonderful, must try this Sayantani. Very Nice!! My sis loves salads!